AWESOME!! My favorite hero! great work! WHERE CAN I BUY THT MY LIL BRO WOULD DIE FOR THT!!!!!!!!!!!!!!!!!! love it, any chance of some Left 4 Dead figs? This is absolutely amazing! I've just started to learn about and make custom toys but this is far beyond anything I could do! DUDE! I just saw this today int PS3 mag with the new Star Wars game! Cool! Hey! Woah, it's in the new PS3 mag?? Which issue, I'll have to pick it up! YES! I saw it! You know the Force Unleashed? The Secret Apprentice? You'll find it in the first few pages. That action figure is rad! Unbelievably cool! If he'd come out I'd buy three!!! Man, I wish Valve would make a Gordon Freeman action figure. Perhaps NECA will do a Player Select figure? They just did Altair from Asassin's Creed, Hitman, Lara Croft (twice) Kratos, and Gears of War are up next. Half Life can't be far behind, write NECA! So.... When can i buy one.... WANT!!! He's up on EBay right now!! Actually just go to my site (in my sig) and click the huge words that say 'EBay Auctions' on my page. Can't miss it. Very good, it captures the feeling of the character. That dam crowbar, I can't look at it without imagining it charging. But excellent job as always. The doctor? I'm making his pet headcrab heady! nice! i was gonna offer to sculpt the wee little brain-copulator, but now i don't have to! yay for me being lazy! Aaahhhhh ! Don't kill meee ! 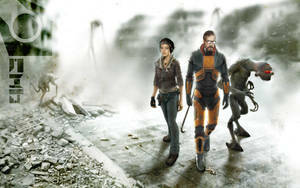 the man with a crowbar.... cool.. now you'v got the chief, snake, and now gordon... hav you made that splinter cell guy? Sam Fisher? He's being made right now. Working on how to light up all three of his night visions lenses at once on his head. oh sweet....that,s some serious led work.. it'd be nice to see the four of them together. very nice! but his armour fully orange? Cause I could do an 'irridiated glow in the dark' Gordon, lol! All glowing orange! haha that's be cool. What I ment was: I thought Gordon's armor was fully orange instead of silver/orange, but I checked it later to be sure and I noticed it was indeed silver/orange. I almost thought this was made from a Master Chief figure. But that would have been too bulky in the end. And ditto that observation of having both a Battlesuit and Glasses, square rimed ones at that. I guess even with all that alien tech, LASIK was never invented? Or is that G-Man just too cheap(you can have your advanced battlesuit, but no, eye care isn't included in the health plan)? I'd quit for that little glaring oversight. But when the worlds in danger, who's going to save it? Maybe the bad guys should try and trip him and make him loose those glasses then they might have a chance(or not). Well at least their not "coke bottle" lenses(then I would question his aiming(a lot!)). niiiiiiiiiiice. I really dig this custom!